Cabinetmakers, it’s that time again. Time to start planning for the AWFS Show in Hot Vegas. If you don’t know where to stay, may I recommend the Renaissance Las Vegas. It’s one of the very few non-gaming hotels, and is smoke free (if those sorts of things appeal to you). This is where our team is staying, and we would love to interface with you and your team before and after the show as opportunities present themselves. Come see us in the cabinotch® booth (booth 9074 in the Central Hall). We would love the opportunity to show you our two cabinotch® cabinet systems (Face Frame and Full Access), and how our approach to cabinet components is unique, and good for your business. We are very intent on providing our custom cabinetmaker clients with what we like to call your “Cabinotch Moment“. Custom Cabinetmaking is a tough business, you are the only sub-contractors that design and engineer a custom solution, then take raw materials and turn them into a custom product, then finish that product (a business in and of itself), deliver that product, then install that product. Custom Cabinetmaking is really several businesses in one, and many of those businesses are very technical in nature, not to mention require a high level of competence. The cabinet itself is the easy part, but making the cutlist is difficult, accounting for material yield is difficult, and everything past machining the parts can be difficult and time consuming, and for many, wrought with opportunities for mistakes.  cabinotch® Innovative Solutions has invested an incredible amount of resources (time and talent) into developing a strategic partnership with KCD Software to enable your cabinet components to be the by-product of your kitchen and/or bath design. If you draw your kitchen with any of our three cabinotch® cabinet libraries (Face Frame, Full Overlay Frame, and Full Access), once you have your cabinet design just like you want it, then you simply choose our Order option, make a few selections, and click on the Order button (aka: Easy Button). Then you can focus on all the other things that make you more money now and in the future, not machining parts (the vast majority of injuries in a cabinet shop happen in this portion of the process, and the most devastating of all injuries happen here as well). So, whether you struggle with finding competent employees, or with keeping your machinery in tip top shape, or keeping up with all the various software upgrades, updates and support, or ordering the right amount of material for the project, and disposing of the off-fall, whatever you struggle with, we think we can help you simplify your business and make more money now and in the future. We would love the opportunity to conspire with you in Las Vegas on how to utilize the cabinotch® system to exploit your core competencies. So put your trade show planning hat on and get started planning that trip to Las Vegas, then come see us in booth 9074.